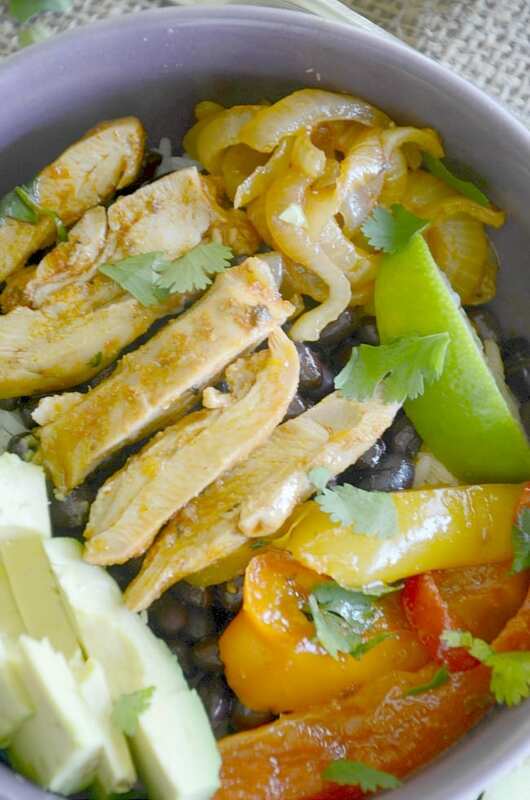 Chicken fajita bowls are the perfect dinner time addition. Oh my gosh yall. It is day 5 of summer break. And I am going crazzzy. I was so super excited for the kids to get out of school. So, so excited. I was done packing lunches, waking up early and driving 20 minutes twice a day. Done, done, done. I couldn’t wait for summer break to start. I counted down the days with the kids. We had a mini celebration the last day of school. School is out.. yayyyy! Literally day 2 of summer break was my breaking point. I had heard “I’m bored” more times than I thought humanly possible. I had to make three meals a day for three kids. I listened to what seemed like non-stop fighting over everything. Everything. Over everything. Every.little.thing. I’m sure you get the point. They fight like cats and dogs. No. They fight like two dogs who haven’t eaten in days going after the last piece of kibble in the dish. It is non-stop. And the whining. Oh the whining. I haven’t even mentioned the constant need for snacks. SNACKS ALL DAY. I hear my pantry door open and close more times than I can count. My kids are 7 and 8 but I swear I am feeding two teenagers with the amount of snacks they consume. I try and sneak away to my office a few times a day but I have to hustle back to the living room or their bedrooms to referee. Break it up people, it’s just a fruit snack. I can buy more. Yes, that is an actual conversation I had with my kids this week. YESSSSH. Score. Bye for an hour tiny teenagers. Sometimes dinner doesn’t even take that long, I just like to hang out in the empty kitchen. Alone. In the quiet. With no one asking me about snacks. Or where the remote went. Or why so and so took their book. Even the onions and peppers came from leftover sheet pan chicken fajitas, so all I really had to do was make the rice. Which of course didn’t take an hour, but don’t tell Ryon that. 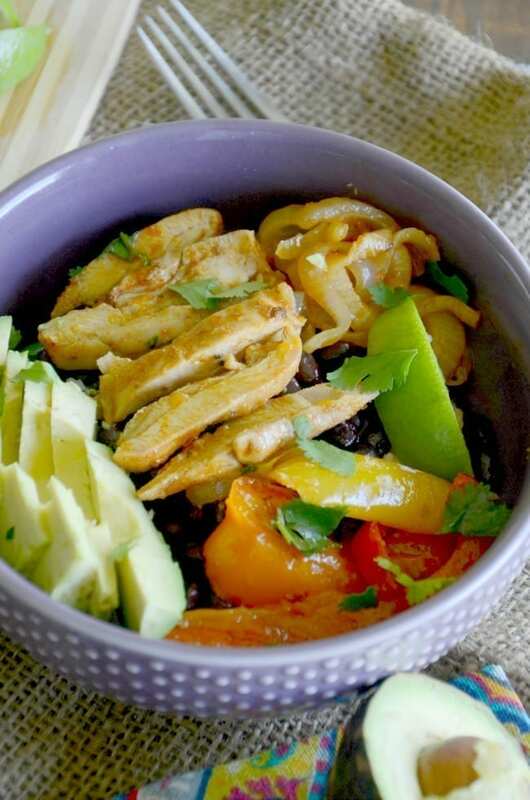 So there are two ways to make these chicken fajita bowls – use leftovers or cook and assemble the fajita bowls that night. Either way works. But if you want more (quiet) down time in the kitchen away from kids, use leftovers. Shhhh. An easy weeknight dinner made with leftovers. Also makes a great lunch! 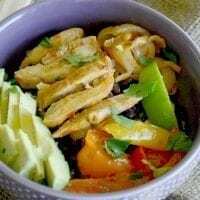 Toss the bell peppers, onion and chicken in a large ziplock baggy. Mix together the fajita seasoning, olive oil and lime juice. Pour into the ziplock baggy and coat well. Place the mixture in the fridge for 10 minutes up to one hour to marinate. Remove from fridge and spread out onto a sheet pan. Bake, uncovered, for 30-40 minutes or until your veggies are soft and your chicken is cooked through. Remove from oven, cut your chicken and return to your sheet pan. 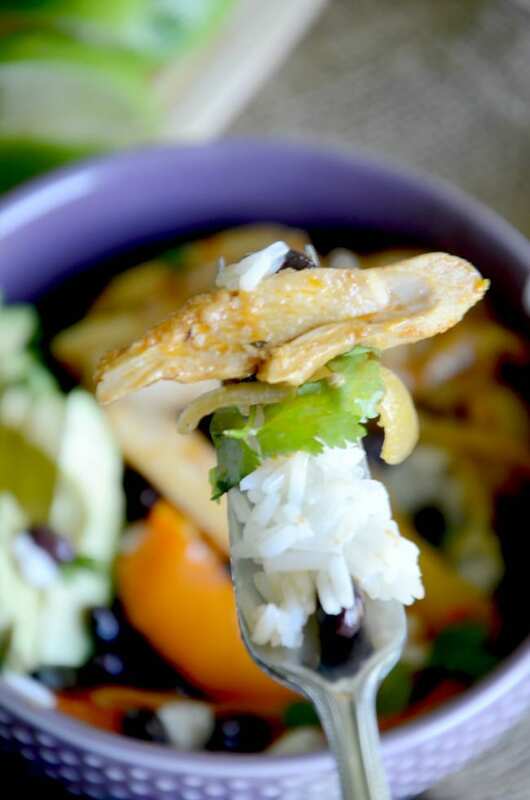 Layer 1 cup of rice, 1 cup of black beans and fajita chicken. Add in the onion, peppers and avocado. Sprinkle with cilantro and lime. Thanks so much Jane! It’s quickly becoming one of my favorites! This recipe is very cool and I want to make this one soon.